Hate Crime Or Parking Dispute? 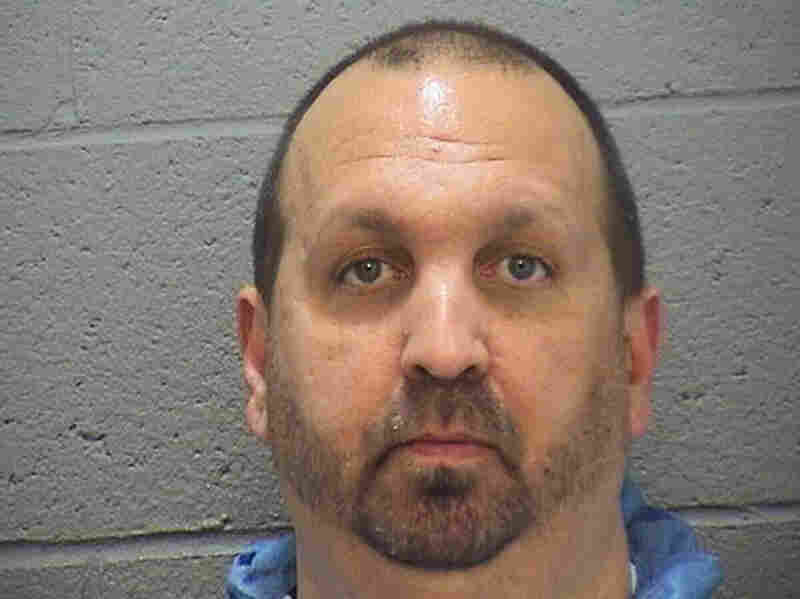 Killing Of 3 Muslims In N.C. Sparks A Debate : The Two-Way Craig Stephen Hicks, who turned himself in, was charged with first-degree murder. The police chief said the department would investigate whether the crime was "hate-motivated." 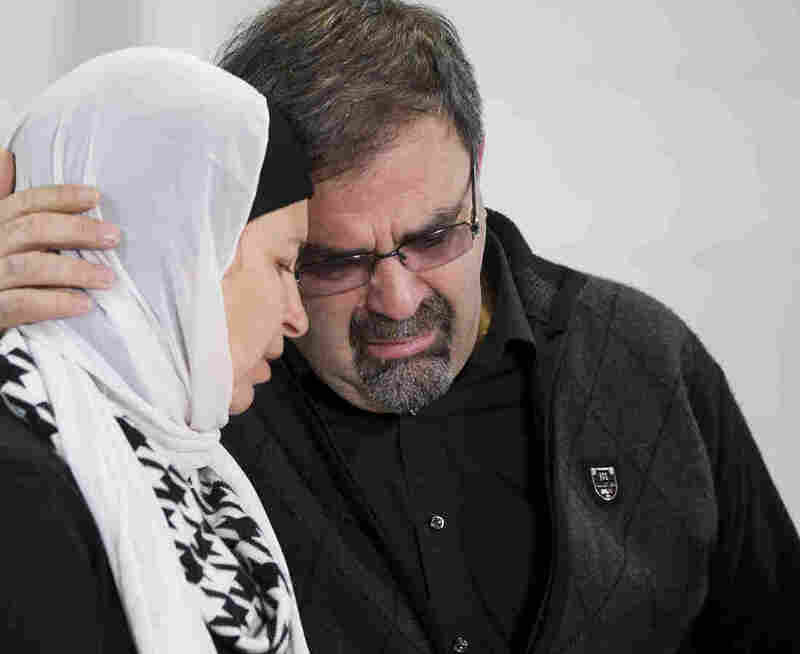 Namee Barakat embraces his wife Layla Barakat during a news conference at the Swift Creek Exchange Club on Wednesday, in Raleigh, N.C.
Deah Barakat; his wife, Yusor Mohammad Abu-Salha, 21; and her sister, Razan Mohammad Abu-Salha, were killed Tuesday. The photo comes from a Facebook page created by friends of the trio. Police said that they would continue to investigate the killing of Deah Barakat and his wife, Yusor, as well as Yusor's sister, Razan Abu-Salha. They said that at the moment it appeared that Hicks, who was a neighbor of the victims, had shot and killed the family after a dispute over parking. As the day went by however, family members of the victims and Hick's wife painted different portraits. NPR member station WUNC, which is live blogging the developments, reports that in a press conference Suzanne Barakat, Deah's older sister, asked authorities to investigate the incident as a hate crime. But shortly thereafter the suspect's wife, Karen Hicks, said that the murders had nothing to do with religion. In the eyes of her husband she said, everyone was equal. The Charlotte Observer reports that Dr. Mohammad Abu-Salha, the father of the two women killed, said Hicks had threatened the family in the past. "It was execution style, a bullet in every head," Abu-Salha told the paper. "This was not a dispute over a parking space; this was a hate crime. This man had picked on my daughter and her husband a couple of times before, and he talked with them with his gun in his belt. And they were uncomfortable with him, but they did not know he would go this far." The Daily Tar Heel, the student newspaper at the university, tweeted a picture that showed a crowded candlelight vigil. The school community gathered, the Tar Heel reports, to listen to officials and family members speak. "Do not reply to ignorance with ignorance," the paper quotes Deah's brother as saying. The victims were part of a tight-knit Muslim community in North Carolina, Nazmi Albadawi, who went to school with Barakat, tells WUNC. "The fact that it's these two families that are so well known, so well respected and so well liked ... it makes it even ... it hurts everyone," he said. "It's like everyone lost a member of their family, almost." The inquiry into the three shootings continues, but the Chapel Hill Police Department says that the "preliminary investigation indicates that the crime was motivated by an ongoing neighbor dispute over parking." "Our investigators are exploring what could have motivated Mr. Hicks to commit such a senseless and tragic act," police Chief Chris Blue said. "We understand the concerns about the possibility that this was hate-motivated, and we will exhaust every lead to determine if that is the case," Blue said. "Our thoughts are with the families and friends of these young people who lost their lives so needlessly." A photo from the Durham County Sheriff's Office shows Craig Stephen Hicks, 46, who was charged with three counts of murder early Wednesday. Blue says that Hicks is cooperating with investigators and that the department could release more information "at a later time." 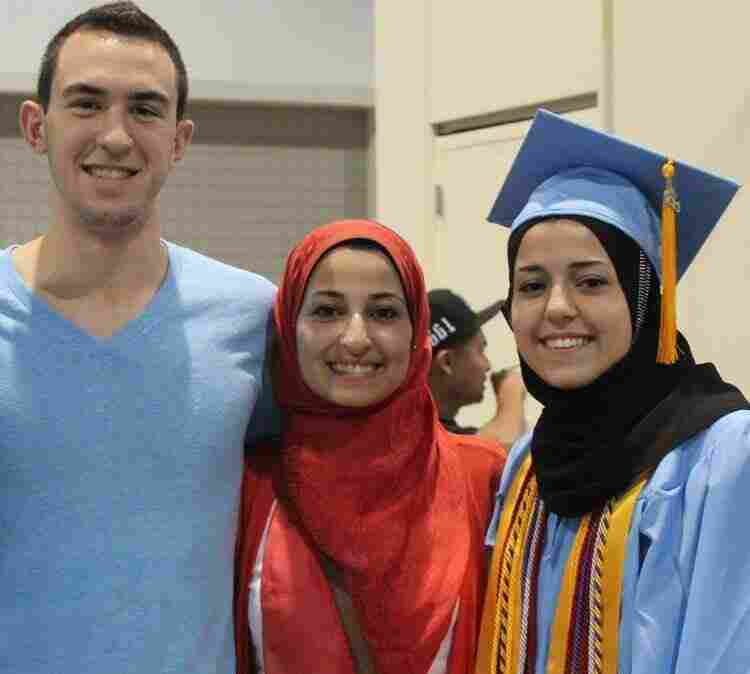 "The victims are Deah Barakat, 23; his wife, Yusor Mohammad Abu-Salha, 21; and her sister, Razan Mohammad Abu-Salha, 19. Barakat and Abu-Salha were students. "The murders happened in the quiet Finley Forest neighborhood a few miles east of the UNC Chapel Hill Campus. "Craig Stephen Hicks, 46, turned himself over to authorities last night. Police haven't released any information about a motive for the murders." The case quickly attracted international attention — and sparked suspicions on social media that the victims might have been attacked because of their religion. On Twitter, #ChapelHillShooting became the top trending hashtag, with many using the tag to criticize American media outlets for what they viewed as a lack of coverage. In Chapel Hill, student newspaper the Daily Tar Heel reports that Barakat was in his second year at the UNC School of Dentistry, where Yusor Mohammad Abu-Salha was planning to start studying in the fall. The paper says Razan Mohammad Abu-Salha was a student at N.C. State University. N.C. State says all three of the victims had attended the school as undergraduates, and that all had earned academic distinctions. Today, Chancellor Randy Woodson issued a statement, saying, "On behalf of the entire NC State community, I'd like to extend our deepest condolences to the families and friends of Deah Shaddy Barakat, Yusor Mohammad and Razan Abu-Salha." "Barakat, a Syrian-American, majored in business administration and management at NCSU before enrolling at UNC-Chapel Hill in 2013 to pursue his doctorate in dental surgery. "Both he and Abu-Salha advocated for global dental health, providing care and supplies to people in the United States and the Middle East. On Jan. 29, Barakat posted a Facebook photo of a Durham project that gave dental supplies and food to more than 75 homeless people this year." A look at Barakat's Twitter feed shows that he was a big basketball fan, particularly devoted to Stephen Curry, who starred at Davidson College in North Carolina before moving on to the NBA. He also posted about dentistry — and occasionally, about a topic that has come to define our time, as when he said, "It's so freaking sad to hear people saying we should 'kill Jews' or 'kill Palestinians.' "